The Yamaha Model History Section offers photos and specifications of Yamaha models from 2007 through the current model year. Yamaha is Japan’s second largest motorcycle manufacturer and one of the Japanese Big Four motorcycle brands (with Honda, Suzuki, and Kawasaki). In 1980, Yamaha made their official USA ATV debut with the 3-wheeled Tri-Moto. The Tri-Moto, like the rival Honda US90 (later called ATC90), was an important piece of not only Yamaha’s own but ATV history itself. Guided by Yamaha’s in-house mantra, the “Spirit of Competition”, the company launched the 1983 225DX with such innovative features as shaft drive and electric start and in 1985, introduced their first 4-wheel ATV, the YFM200 Moto-4. Yamaha spent the 1980s challenging the competition within the ATV market with fresh and ingenious designs such as the 1985 Tri-Z 250, 1986 4-Singer, 1987 Banshee, and 1987 Big Bear 350. The late 80s saw the debut of the 1988 Blaster, the world’s best-selling ATV with an engine size under 250cc, and the 1989 Breeze which was Yamaha’s first 4-wheel ATV with an automatic transmission. The 1998 Grizzly 600 set the new standard for utility ATV performance with automatic engine compression braking and push-button on-demand 2WD and 4WD selection. 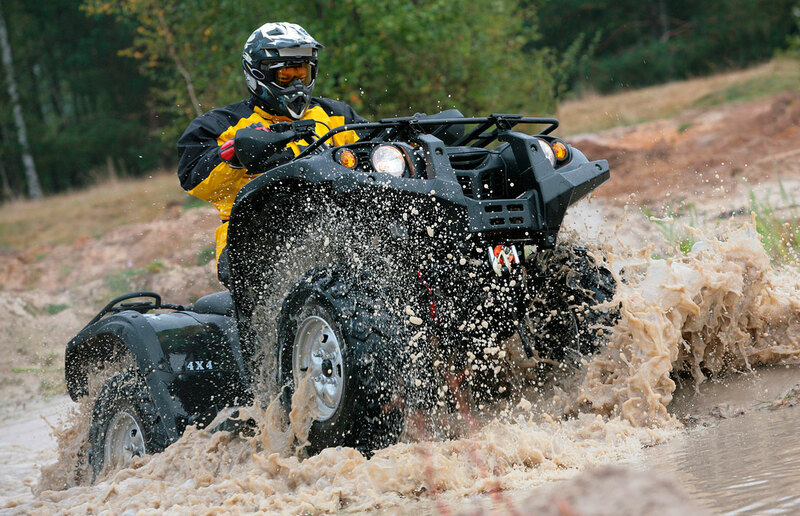 In 1999, Yamaha’s first US-built ATV, the Beartraker, was an immediate success in America and in 2001, Yamaha set another standard in sport performance ATVs with the 660R Raptor. The 2004 Yamaha YFZ450 supplanted the 660R Raptor as the new dominant force in sport ATV performance and provided riders with a true factory showroom racer experience; the YFZ450 came ready to race right out of the box. Today’s current crop of Yamaha ATVs include the high-performance Raptor 700, Raptor 700R, YZF450R, and the workhorse Grizzly and Kodiak utility ATV series. The “Spirit of Competition” continues to drive Yamaha as one of the most trusted brands in off-road and ATV vehicles. At Race-Driven, we are ATV performance enthusiasts who race and ride with a lifetime of powersports experience. Our aftermarket performance parts and replacement components are engineered and crafted to withstand the harshest of everyday utilitarian use as well as the severe abuse of the racetrack. We work closely and directly with our manufacturing, prototyping, and powder coating company located in Escanaba, Michigan to ensure that our in-demand powersports products are available to you, the powersports aficionado, at the lowest possible cost. We’re committed to bringing the highest quality products to all riders at an affordable price.